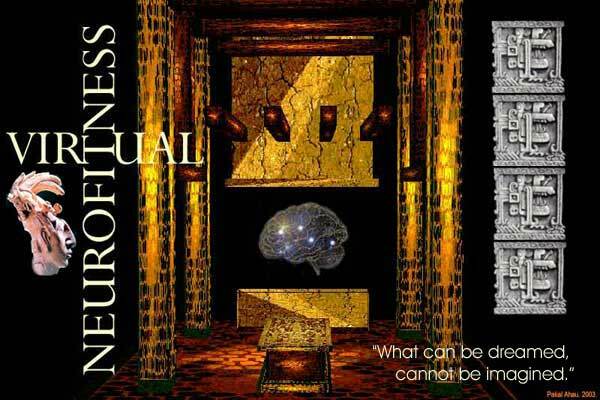 VIRTUAL NEUROFITNESS is a scientific faith for a fast society growing and dying in age and number. In 1993, Pakal presented this new idea to his friends as a new spiritual experience for the aging masses at the Philosophical Research Society in Los Angeles. It is time to open the archives of the Temple of Life and Death of Our Lord Pakal Ahau so that you learn how to live with love and dignity, stay young and intelligent longer at the end of your life and design your own conscious dying. For a more recent study written by Lord Pakal Ahau, we refer the reader to the article King Pakal's Nirvana in our new website. Welcome to the Kingdom of Lord Pakal Ahau: Click for the one's self in your brain. All rights reserved. Copyright 2003. For private use only. Pakal Ahau Entertainment.